If you love pesto and are interested in something different, then this zucchini pesto is the ONE for you. I have used roasted zucchini, which adds extra complexity to the sauce, but you sure can use the raw one instead. Serve them with rye crackers or some toasted country bread. Preheat the oven to 200C/400F. Cut the zucchini into half lengthways. Grease a baking pan with a little of olive oil, and place the zucchini, cut side down, in the pan. Brush the zucchini with half tablespoon of olive oil. Roast zucchini for 15 minutes. Cut the zucchini into small pieces and place them in a blender with garlic cloves, almond, and basil. Pulse unti the mixture is blended. Add in grated Parmesan and olive oil. Season the mixture with lemon juice, salt and black pepper. Serve with rye crackers. This simple, refreshing salad features the fragrant, and slightly sweet fennel, fresh and juicy orange, crunchy Romaine lettuce and carrot. Make it as a side salad, or enjoy it as a light lunch with some homemade bread. Rinse, dry, and tear the lettuce into bite-sized pieces. Remove the peel and pith from the oranges. Cut the orangees into slices. In a large bowl, place the lettuce pieces, carrot strips, sliced fennel and oranges. Drizzle with olive oil and white wine vinegar. Taste with salt and black pepper. Gently toss and serve. Potato salads make the perfect accompaniment to many meat dishes or a delicious and hearty meal on their own. I personally prefer the roasted potatoes instead of usual boiled one for my potato salads as it intensifies the flavour. If you can't find the smoky black forest bacon, use regular bacon. Heat oven to 210C/420F. Place the potatoes in a roasting pan, then rub with rosemary infused olive oil, rosemary leaves and a sprinkling of salt. Roast for 30 mins until the potatoes have turned a deep golden brown. Leave to cool slightly. Heat a skillet over medium heat. Dry-fry the chopped bacon until crisp. Whisk sour cream, mayonnaise, lemon juice, capers, and the basil in a large bowl. Add in roasted potatoes and crispy bacon. Toss to coat and serve. 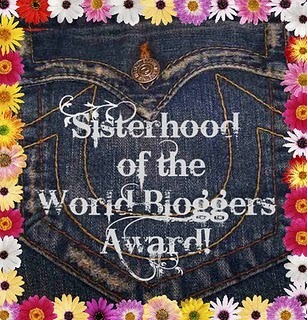 I want to thank Elisabeth at foodandthriftfinds for passing the "Sisterhood of the World Bloggers Award" to me and Raven at Ravienomnoms sharing her "Stylish Blogger Award" with me. Thank You, ladies! This chickpea salad is tasty and healthy, high in fiber, protein and full of flavours! Tossed with sundried tomatoes and reduced fat feta cheese, perfect for a light but filling lunch. Tip the chickpeas into a sieve and rinse under cold running water. Drain and place them in a large bowl. Drain the sundried tomatoes and finely dice. Add the chopped sundried tomatoes, together with crumbled feta, chopped chives and chilli into the bowl of chickpeas. Drizzle in the lemon juice, then season with salt and pepper. Gently toss to combine. A wonderfully rustic Italian flat bread with rosemary, chopped cranberries and pine nuts. Focaccia, originated in Italy and usually prepared with olive oil, flavoured with rosemary (or sage)and coarse sea salt, is quite versatile. For salads, or sandwiches, or to accompany soups and dips, Focaccia is the perfect choice. In the bowl of your stand mixer attached with a dough hook, add in flour, yeast, sugar and salt. Pour in water and 4 tablespoons olive oil. Mix on low speed until dough comes together. Increase speed to medium and mix until dough is smooth, about 5 minutes. Turn dough onto a lightly floured work surface and knead briefly to form into a smooth ball. Coat the mixing bowl with 1 tablespoon of olive oil, place in the dough ball, and turn to coat all sides. Cover with a plastic film and let rise in a warm, draft-free place until doubled in size, about 1 hour. In a small saucepan over medium heat, combine 2 tablespoons of chopped rosemary and 2 tablespoons olive oil. Heat the mixture until olive oil bubbles, about 1 minute. Add in chopped cranberries and remove from heat. Let cool to room temperature. Line a baking tray with parchment paper and set aside. 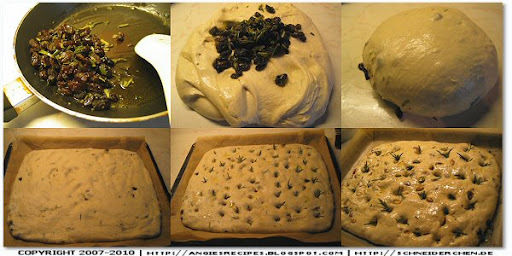 Once dough has risen, punch it down, place on a lightly floured surface, and knead in cranberry mixture, and pine nuts. Form the dough into a tight ball, cover and let rest for 15 minutes. On a lightly floured surface, pat the dough into a sheet and lay it on the prepared tray. Cover with a cling film and allow it to rise until doubled, about 45 minutes. Preheat the oven to 200C/400F. Dimple the dough with your fingertips and place the rosemary leaves in the indentations. Drizzle the remaining tablespoon of olive oil over the top of the dough and sprinkle with fleur de sel. Place loaf in the middle shelf of the oven and mist the inside of the oven with 3 or 4 sprays of water. Bake for 30 minutes until golden. Cool on a wire rack. Serve warm. Lisa H, from My Lemony Kitchen, was hosting a "Cambodian Souvenirs" giveaway last month. There are 3 very beautiful souvenirs she brought home from her visit to Cambodia: a soft Cambodian silk scarf, a set of beautiful chopsticks and a lovely embroidered purse. 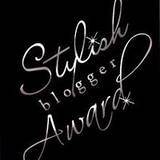 And I am the WINNER of this beautiful soft silk scarf. Thank you, Lisa! I know there are plenty of Brussels sprouts haters out there, but seriously this veggie deserves one more chance. Not to mention their fantastic health benefits, like cholesterol-lowering ability, anti-inflammatory support, cancer-protective substances, etc., they don't taste bad. Ok, I agree that they don't taste heavenly like chocolate, but they are great just like many other vegetables. Don't overcook them or they will smell stinky and taste bitter. It's better to serve them while they are still slightly crunchy. Bring a pot of water to a boil. Blanch the Brussels sprouts for 3 minutes until they are starting to soften slightly. Remove and drain. Heat a frying pan and fry the pancetta until crisp, then remove and set aside. Add the chestnuts and sugar, tossing in the pan, then pour in the vegetable stock and reduce by half. Add in Brussels sprouts and pancetta back to the pan. Stir to combine. Transfer to a plate and serve warm. Zwiebelkuchen, which literally means "onion cake" in the German language, is actually a savoury tart (a quiche?) prepared with onions and sour cream on a leavened or yeast dough, that is very popular in the German wine-growing regions. Serve them warm with a glass of chilled half dry German Risling or fruity Corbières if you prefer red. Cut the ends off the onions and slice them into thick rings. Slice the spring onions into rings too. Heat a skillet with olive oil over medium flame. Add in onions and stir-fry until lightly golden. Stir in chopped spring onions. Season the mixture with salt and pepper. Turn off the heat and set aside. Combine the flour, baking powder, salt and sugar in a mixing bowl. Add in egg, Quark, olive oil and milk. Stir until the dough forms a ball. Preheat the oven to 180C/350F. Line a baking tray, about 30x40 cm, with parchment paper. Roll out dough on a lightly floured surface into a rectangle and fit into prepared baking tray. Top the dough with the herb cream evenly. Spread the caramelized onion all over the cream. Sprinkle the top with salt, pepper and cumin. Bake for 25-30 minutes until beautifully browned. "Zürcher Geschnetzeltes" or "sliced meat Zurich style" is a popular Swiss dish from Zurich region. Its main ingredients are schnitzel, mushrooms and cream. While it is possible to use any type of meat to make this dish, the real "Zürcher Geschnetzeltes" is made with cut veal. It was originally prepared using meat only, a popular variation today is adding about a fourth of sliced veal kidney to the meat. It usually comes with Rösti, similar to hash browns, but it could also be served with rice, or pasta. Finly dice the shallots. Cut the chicken filet into strips. Season the chicken strips with pepper and paparka powder. Add the remaining oil in the skillet. Stir the finely chopped shallots till softened and lightly browned. Pour in the white wine and bring it to a boil over a high heat before adding cream and chicken stock. Cook over a medium heat for about 2 minutes then return the chicken strips and any accumulated juices to the pan. Cut the softened butter into smaller pieces and place them in a mixing bowl. Sift in icing sugar. Beat on the low speed to blend the butter into the sugar. Increase the speed and mix for about 1 minute until creamy and smooth. Beat in one egg yolk until blended. Whisk together the pastry flour, ground almond and cinnamon. Add the flour mixture into the creamed butter. Mix until it comes together. Wrap the dough with a plastic film and chill for 1 hour. Prepare two baking trays with parchment paper. Preheat the oven to 200C/400F. Remove the dough from the fridge. Roll the dough out to a thickness of 5mm. Use a heart-shaped cookie cutter about 5 cm in diameter, cut out about 50 cookies. Place them on the prepared baking trays. Beat the remaining egg yolk and brush the top of cookies. Top each cookie with one blanched almond. Bake for about 12 minutes. Remove and cool on racks.